VICTOR B. “VIC” DODD, age 77 of Mt. Airy, Georgia passed away on Sunday, March 11, 2018. Born in Mt. Airy, Georgia on November 04, 1940, he was a son of the late Henry Lewis Dodd & Bertha Franklin Dodd. Mr. Dodd served his country proudly in the United States Marine Corps. and was retired from Patterson Pump with many years of service. Vic loved the Lord most of all, and shared that love with his family and friends in his community. He enjoyed hunting, farming, and watching his garden grow. Vic was a member of the Chopped Oak Baptist Church where he served as a deacon. He was also a member of the Mt. Airy Masonic Lodge #141 F& AM for over 50 years where he served in various capacities including Past Master. In addition to his parents, he was preceded in death by his siblings, Leola Duvall, Barbara Andrews, Betty McCurry, Bill Dodd, & H.L. Dodd. Survivors include his loving wife of 54 years, Lynda Dean Dodd of Mt. 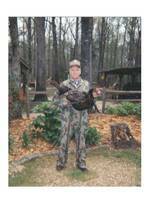 Airy, GA; children, Keith & Linda Dodd, Kelly Dodd Dewberry, Rick Trotter all of Mt. Airy, GA; Sandy & Lanny Banks of Toccoa, GA; sister, Genell Wood Bryant of Clarkesville, GA; brother, Jack Dodd of Gainesville, GA; granddaughters, Amber Patino of Oakwood, GA; Morgan Dewberry of Mt. Airy, GA; great-grandchildren, Oliver & Addalee Patino of Oakwood, GA; numerous nieces, nephews, other relatives, & friends. Funeral services are scheduled for 2:00 p.m. Thursday, March 15, 2018 at Chopped Oak Baptist Church with Rev. Scott Slaton, Rev. Thomas Gragg, & Rev. Alvin Burns officiating. Interment will follow in the church cemetery with military honors provided by the United States Marines, Grant Reeves VFW Post #7720, Habersham County American Legion Post #84, and the Rabun County DAV Chapter #15. Masonic Rites will also be provided by the Mt. Airy Masonic Lodge #141 F & AM. The family will receive friends at the funeral home from 2:00 p.m. until 4 p.m. & 6:00 p.m. until 8:00 p.m. on Wednesday. Flowers are accepted or memorials may be made to the Masonic Home of Georgia, 1417 Nottingham Dr., Macon, GA 31211.